Chelsea midfielder Frank Lampard has won the FA Cup "Player of the Round" award for his performance in their quarter-final against Tottenham. Lampard scored twice as the sides drew 3-3, before Chelsea won the replay 2-1. The other four contenders for the award were Watford duo Ben Foster and Dan Shittu, Tottenham's Dimitar Berbatov and Middlesbrough's Julio Arca. 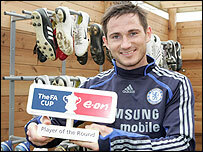 Lampard will join the nine previous winners from earlier rounds in the "Team of the FA Cup" for 2006/07. The "Team of the FA Cup" so far comprises Matt Lewis (Halesowen Town), Gary McPhee (Nuneaton Borough), Byron Bubb (AFC Wimbledon), Paul Booth (Lewes), Kris Commons (Nottingham Forest), Phil Jevons (Bristol City), Jason Puncheon (Barnet), Jamie McAllister (Bristol City), Adam Federici (Reading) and Lampard. The final player to complete the XI will be chosen from the FA Cup semi-finals.